Located in Central Africa, the Republic of Chad is one of the continent's most troubled nations. Political conflict and violence are rife, with most trouble occurring in the capital city, N'Djamena. Chad is also one of the world's poorest countries, where most of the population survive through subsistence farming. People have lived in the Chadian basin since around 700 BC. Today, the region is home to over 200 different ethnic groups. French and Arabic are the official languages, while Islam is the most widely practiced religion. Chad's desert climate and landlocked location have earned it the title, 'Dead Heart of Africa'. That said, a savannah region in the south provides some respite from the desert, as does Lake Chad, which is one of Africa's largest wetlands. Near-constant conflict has plagued Chad for decades, discouraging most people from choosing it as a holiday destination. Indeed, the British Foreign Office and many other travel authorities advise against non-essential travel to the country. 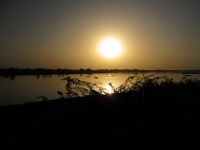 Most visitors are merely passing through and spend a touristy day in N'Djamena. Some venture to the nearby village of Gaoui, where they take in the traditional pottery and architecture. Even though Chad is not a popular safari destination, Zakouma National Park is among central Africa's best game reserves. Its wildlife population includes lions, giraffes, wildebeest and herds of elephants. The stunning desert landscape of Ennedi also has great potential from a tourism perspective. Safety issues and lack of infrastructure discourage visitors.